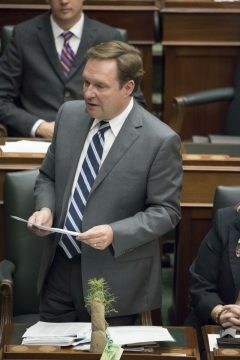 For the second consecutive week, Wellington-Halton Hills MPP Ted Arnott has spoken in the Ontario Legislature about the environment plan in the People’s Guarantee. In doing so, he rebutted false Liberal attacks. Mr. Arnott serves as the Ontario PC Caucus Critic to the Minister of the Environment and Climate Change. Once again this week, we have seen evidence that the Liberal Government is prepared to say literally anything to try to hang on to power. In recent days, the Premier’s claims that our proposal to phase out their cap-and-trade program, and replace it with a carbon pricing program, in line with what the Trudeau Government is requiring and which would return all of the revenues to Ontarians, would cost more and would not be as effective in reducing carbon emissions, were shown to be patently false by the respected national magazine, Maclean’s. In fact, the Maclean’s article demonstrated that the People’s Guarantee will do the opposite. The study by economist Trevor Tombe‎ suggests our plan would in time leave Ontario households better off than what the Liberals say, and reduce emissions more in Ontario, than under their cap-and-trade program. ‎This leads us to another important environmental issue: that being, our responsibility to protect and preserve our groundwater today and for future generations. Over and over again, I have repeated my position on this issue, including my view that we need to do more to improve the recycling rates of empty water bottles and other single-use plastic beverage containers. How is this best achieved? It appears that each province has its own approach, with varying degrees of success. I’m told the Province of Manitoba’s “Recycle Everywhere” program has been impressive in dramatically improving recycling rates. It deserves a good hard look, in the context of Stewardship Ontario’s ongoing consultation on the Blue Box program. I’m also aware of the Town of Erin’s Public Space Recycling Project. Town Council and Staff deserve credit for working with the Canadian Beverage Association, and I know with the enthusiastic support of the people of Wellington-Halton Hills, this effort will be a success, and an example for the rest of the Province.